Heading outside to view the wonderful light displays? Taking a trip to Whistler Village to watch the people or hit the slopes? Perhaps just a walk around the Sea Wall with friends? All of these activities have something in commom: they need some nice warm mittens! 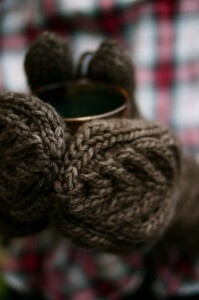 I recommend a pair of Antler Mittens, designed by moi. 2 skeins of Blue Sky Alpacas Worsted Hand Dyes will do a pair (with some pretty long cuffs) although I’ve been eying the Madelinetosh Vintage in Twig, one skein for a pair. They knit up quick and they are the epitome of toasty. This entry was posted on Sunday, December 18th, 2011 at 11:20 pm	and is filed under Uncategorized. You can follow any responses to this entry through the RSS 2.0 feed. Both comments and pings are currently closed.